Jiangsu, a fertile 'land of fish and rice' since ancient times, is a province with a long history, abundant highlights and relatively developed economy. Jiangsu is the birthplace of Wu Culture. From as early as several hundred thousand years ago, it has been a place where human beings inhabited. About 6,000 years ago, primitive villages showed up near Taihu Lake and Hongze Lake of this area, which record agricultural civilization. When China’s first unified dynasty, the Qin Dynasty (221 BC - 207 BC) was built, this region was territory of Jiujiang, Kuaiji and the other prefectures. During the Three Kingdoms Period (220-280), its northern part belonged to Wei while the southern was under control of Wu. Nanjing, called Jianye at that time, was the capital of Wu. After that, Nanjing has acted as the capital for another five dynasties in history, hence the name 'ancient capital of six dynasties'. Nowadays, Nanjing is the capital city of the province. In the dynasties following the Three Kingdoms Period, this area was administrated either separately or as a whole by different administrative units. The present territory of the province was initially shaped in the Qing Dynasty (1644 -1911). 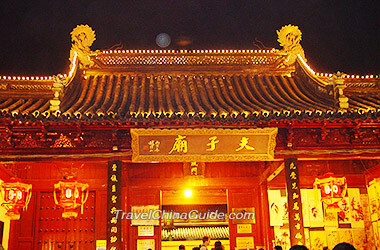 This rich history rewards the area with a lot of cultural relics like Confucius Temple, the Qinhuai River, Ming Xiaoling Mausoleum, Dr. Sun Yat-sen's Mausoleum, Daming Monastery and Nanshan Temple. Located along the lower reaches of the Yangtze River, Jiangsu is a place of typical Jiangnan (south of the lower reaches of the Yangtze River) landscapes, represented by classical gardens and water townships. An old saying goes this way: 'the gardens south of the Yangtze River are the best under heaven and among them the gardens of Suzhou are the best'. 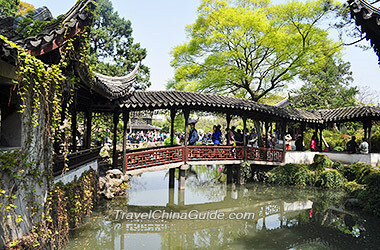 Suzhou, a famous tourist city of this province, possesses the best classical gardens of the country, including Humble Administrator's Garden, Garden of Master of Nets, Canglang Pavilion and Lion Grove Garden, etc. These skillfully-built classical gardens show how natural scenery and man-made architecture co-exist harmoniously from every single detail like exquisite layout, beautiful color and unique structures. Ancient water townships like Zhouzhuang, Tongli and Luzhi are also representatives of local landscapes. Little bridges over murmuring brooks, rustic cottages along stone-paved streets and tranquil atmosphere all offer visitors unique and special feelings. In addition to attractive landscapes, the area is also famous for its amazing folk arts and well-made handicrafts. Here, visitors can enjoy China's oldest opera - Kun Opera and appreciate colorful brocade- Yun (or Nanjing) Brocade, vivid Suzhou embroidery, small but lovely Huishan clay dolls, delicate Changzhou combs, beautiful Yixing teapots and colorful Nantong kites, etc. Last but not least, delicious Su Cuisine, one of the country's eight cuisines, is also a must for visitors going here. Due to its excellent environmental conditions and geographical advantages, Jiangsu has been a relatively developed area since ancient times. Situated along the Yangtze River, the area is mostly covered by fertile plains, fresh-water rivers and lakes. It belongs to a transition zone from warm temperate zone to subtropical zone, featuring mild temperature and hot rainy season. All these have helped the area to develop its agriculture. No wonder it has long been called 'a land of fish and rice'. What's more, its coastal location is very convenient for communication with the outside world, leading to its fast development in both imports and exports. In the year 2010, the GDP of the province was second only to Guangdong while its per capita GDP ranked first among all China's provinces (except municipalities). Passport holders of some countries and regions can possibly enjoy a visa-free stay of 144 hours if they make transit in Nanjing Lukou Airport. Hie, I'm in Guangzhou trying to find my way to Jiangsu. How can I make it possible? Thank you. Dear, could you tell me which city in Jiangsu you will go to? Then I can tell you the way. And you can choose train, bus and plane to finish the trip. How to take bus or train from Yangzhou to Shanghai?? Thanks for anyone to help!! Take a bus from Yangzhou West Bus Station to Zhenjiang in 40min. Then take a high speed train at Zhenjiang Train Station to Shanghai which takes 1.5h. At Yangzhou East Bus Station or West Bus Station, there are direct coaches to Shanghai and it requires 3h or around. how to go to Jiawang District -XuZhou- from Guangzhou? As I know, the bullet train costs about 8 hours. As for the return air ticket, it changes frequently according to many factors, so I can only provide a rough price, it may cost around CNY1400. My childern are joining Jiangsu univerity and how can they reach from Shanghai Pudong Airport? Upon landing, take airport shuttle bus line 1 and get off at Hongqiao Railway Station first. It takes around an hour on the way. Then take the bullet train to Zhenjiang Railway Station. The duration is about 2 hours. After arriving, for your convenience, just take a taxi to the campus directly. The cab fare is CNY 30 in the day time.